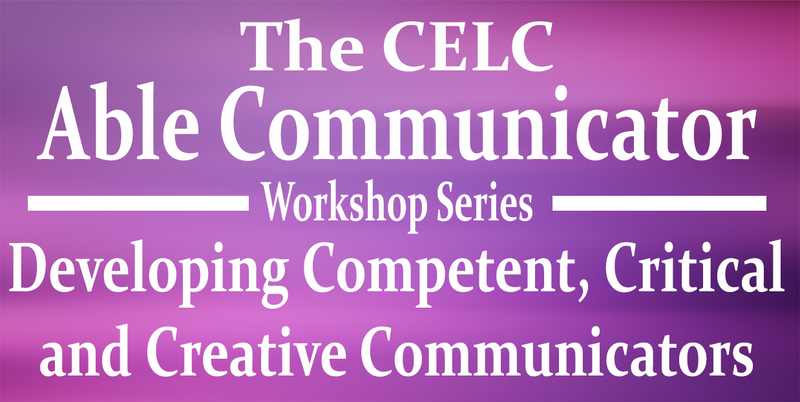 This workshop series aims to develop and hone students' communication skills in a fun and interactive way, with plenty of hands-on activities. Registration for the following workshops is now open to all NUS students. Places are limited so please hurry to secure your place. This 3-hour workshop aims to address some common issues in pronunciation in Singapore English. It will highlight words that are commonly mispronounced and help participants to clarify confused sounds. For example, do you say access/assess the same way? Or fist/feast? And how do you pronounce pleasure/pressure? How about words like connect, control, contact? Does the first part [con] sound the same in each word? Did you know project is pronounced differently as a verb and as a noun? The workshop will take you through these and many other words and sounds typically mispronounced by Singaporean speakers of English. At the end of the workshop, you will have an increased awareness of these pronunciation issues and also develop sensitivity to subtle differences in sounds, so that you can train yourself to speak more accurately and clearly. Foreign students will also benefit from this workshop. Mr Richard Seow is a lecturer in CELC, with many years of experience teaching academic writing and oral communication courses. He has a passion for coaching students in pronunciation. PowerPoint slides are one of the most common tools for presentations but not everyone knows how to use them effectively to complement their presentations. In this workshop, you will learn how to create PowerPoint slides using “Assertion-Evidence slide design” as an alternative to PowerPoint’s default structure. This design will enhance audience’s interactions with the presentation and the speaker. You will also learn various verbal and non-verbal communication strategies to maximise the audience’ engagement with your PowerPoint presentations. You will then have the opportunity to apply these strategies by delivering a short presentation to your peers. Who should attend: Anyone who wants to enhance their presentations and engagement with their audience. Strongly recommended for FYP students and postgraduate students. What will you do (what to expect): Plan, design and practise delivering your presentation with PowerPoint slides. Provide and receive feedback on your slides from other participants. Where & when to apply: Any modules that require presentations, final year project presentations, conference presentations, and job talks. Dr Sirinut Sawatdeenarunat is a Lecturer at the Centre for English Language Communication. Currently, she coordinates and teaches SP1541 Exploring Science Communication through Popular Science which greatly emphasises on audience engagement in presentations. The key to successful networking lies in engaging others in a cordial and genuine manner. You may ask: but what should I say and how do I talk about various topics at these events? Planning, practice and thoughtful application of verbal and nonverbal communication strategies are essential for every social and professional networking experience. In this workshop, you will acquire and integrate skills on conversation-making, active listening and use of body language to develop your own approach to networking. Discover new skills and identify your strengths at engaging others through this workshop on applying interpersonal communication skills for networking. Who should attend: You want to network and canvass sponsors, engage peers, liaise with internal and external partners (e.g. freshmen, parents, visiting professors, industry partners), orientate guests, build contacts, engage acquaintances. What will you do (what to expect): Interact informally with facilitator and participants. Try out short, simple verbal and non-verbal skills. Share casually about ideas on common topics (e.g. movies, the ideal job). Where & when to apply: Anywhere, immediately after the workshop. Who had attended and benefitted: residential colleges’ leading committees, to-be graduates attending networking sessions and group interviews, professionals looking at building contacts and enhancing relationship with contacts, researchers working in teams and pitching for funding. Ms Susan Lee is a lecturer in CELC. She has taught English language and communication skills for 16 years, teaching both tertiary level and adult learners in the corporate environment. She is passionate in designing learning activities to engage and challenge students to apply communication skills beyond the classroom. Interpersonal communication is like air - we do it all the time, but we only notice its importance when something goes wrong. To avoid such situations, we need to understand how to build relationships of mutual understanding and respect with our fellow students, colleagues, and superiors. Knowing and applying the principles of interpersonal communication in a professional setting is a necessary condition for effective performance (both in working and studying) and professional growth. How to provide useful feedback without hurting your peer's feelings? How to stand for your opinion without offending your colleagues? How to persuade others to follow your line of action? How to say "no" to your boss without being fired? These are the questions that the workshop is going to address. By the end of the workshop you will learn effective strategies for building empathy and assertiveness, providing tactful and constructive feedback, managing conflict and disagreement. Be ready to participate in practice activities and role-play simulations! Dr Tetyana (Tania) Smotrova is an experienced Professional Communication lecturer with the Centre for English Language Communication. She has taught Business Communication to undergraduate business students for four semesters. Her research interests include gesture, non-verbal communication, professional communication, and academic writing. Do you struggle with your voice and body language every time you make an oral presentation or speech? Do you wish you could overcome your fears and self-consciousness and learn to enjoy public speaking? Or maybe you would like to uncover the secrets of confident presenters who speak and connect with their audiences so effortlessly? This workshop aims to address the common fears and stumbling blocks many of us face at the prospect of public speaking and develop the fundamental communicative tools of every speaker - our use of voice and body language to capture attention and appeal to an audience to create a stage presence that will make an impression and sustain audience interest. You will learn practical hacks to release anxiety and overcome your fears and feelings of self-consciousness. You will practise vocal exercises to enhance your vocal articulation and also attempt improvisation exercises to become more comfortable with your use of voice and body language to develop your confidence as a speaker. Undergraduates who are new to public speaking; graduating students who have had little exposure to public speaking and need a refresher; post-graduate students who are new to teaching or mentoring undergraduates; anyone with a fear of public speaking. Ms Lee Sher Lin was a scriptwriter, director and producer with the Television Corporation of Singapore and the creator of Singapore’s first Creative Writing for Television and New Media diploma at Singapore Polytechnic. Her passion for storytelling, honed since her NUS undergraduate days as a literature student practising theatre, has led her to work with students, actors and entertainers in the film and media industries across the region. She currently teaches FAS1102: Public Writing and Communication with CELC. In a highly competitive world, opportunities to pitch your ideas to those who may be helpful to you are sacred. You need to maximise your chances of “being heard” and ensure that you explain your ideas in a manner that requires the least amount of work from the audience. In this workshop, you will learn the principles of the elevator pitch including identifying the context, purpose and audience of your pitch. Our learning activities will help you craft an audience-centric elevator pitch that you can adapt for different situations. Who should attend: Anyone who is looking for opportunities to engage industry partners, impress interviewers, or secure funding. What will you do (what to expect): Plan, prepare and practise delivering your pitch. Provide and receive feedback on your pitch from other participants. Where & when to apply: Job interviews, start-up competitions, internship opportunities. Dr Sirinut Sawatdeenarunat is a Lecturer at the Centre for English Language Communication. Her most successful pitch was her Three Minute Thesis presentation where she won the first prize in her faculty and was the first runner-up in the university round. Do you struggle with what content to cover in your oral presentations? Do you find your audience switching off and not paying attention when you are speaking? Are you guilty of overwhelming your audience and yourself with information overload? Do you wish you could be more effective and persuasive when appealing to your target audience? Public speaking is sometimes informative and educational, but more often than not, it is aimed at persuading a target audience to buy into an idea, change their attitude or take decisive action. So what are some methods that you can use to persuade your target audience to your point of view? How do you tailor our speech to make your message so persuasive that your audience feels compelled to make a change? You will learn to create and analyse your audience profile, tailor your content to your target audience, apply various rhetorical appeals and do some personal storytelling to unleash the effective and persuasive speaker within you. Undergraduates who are new to public speaking; undergraduates who often need to pitch ideas and sell persuasive messages in their courses ; graduating students who will need to present and persuade clients and colleagues in their future careers; student representatives who need to persuade audiences to join their causes. Much of your success at university depends on your ability to convey your learning and ideas through writing. In this workshop you will learn about the language you need for academic writing. Beyond looking at common grammatical errors, we will focus on what successful academic writers do in their texts. The workshop is organised around four essential academic language toolkits which will help you expand your academic language repertoire and make the meanings needed in your discipline. For example, we will look at the resources you need to express your opinion and support an argument by citing sources. We will also look at the resources that enable you to structure a text in a cohesive way. Finally, we will also learn how to achieve an academic tone. As we visit these resources, we will address the common grammatical errors which may still occur in your writing. Write several short texts of different type to discuss issues of register and accuracy. Anyone who wants to enhance their academic register and grammar accuracy. Where & when to apply: Any modules that require writing and presentations. Dr Laetitia Monbec is a Lecturer at the Centre for English Language Communication. She researches disciplinary discourse and coordinates the EAP module at the CELC. Persuasive writing (whether proposals, reports, newsletters, emails, marketing/sales collaterals, online/blog posts, etc.) is about making words ‘sell’ for you, whether you are ‘selling’ an opinion, idea, product or even yourself. Instead of using your voice, posture and gesture, you are leveraging on the power of words to trigger a particular emotion in others and inspire them to take specific action. In this workshop, you will discover how you can ensure written communication is truly compelling and persuasive by understanding your reader. Through exercises, examples and open discussion, you will gain a solid overview of persuasive writing in order to grab readers’ attention and persuade them powerfully. By the end of this persuasive writing workshop, you will know how to write messages that engage readers and inspire actions. Who should attend: Anyone who wants to become more effective at persuading others. What you will do: You will interact informally with the facilitator and participants, engaging in discussions and activities. Where and when to apply: You can apply the persuasion strategies in any type of discourse, immediately after the workshop. Dr Natalie Hudson is a Lecturer at the Centre for English Language Communication at the National University of Singapore. She holds a bachelor’s degree from the University of California at Berkeley and master’s and doctoral degrees in Curriculum and Instruction from the University of Nevada Las Vegas. She has taught for 22 years, teaching both undergraduate and graduate English language and teacher education students in the United States, Mexico, China and Singapore. Understanding the difference between writing for print versus writing for the web starts with learning about how readers behave differently online. In this workshop, you will learn how to accommodate the needs of online readers through writing style, structure and web design. You will learn techniques for writing for online readers such as: characteristics of effective online content; how to write for your audience; the use of keywords, headings, lists and links; and basic elements of webpage design with the incorporation of multimedia. By the end of the workshop, you will be able to write more concisely and credibly, ensuring you deliver your message to readers in the most successful way. Who should attend: Anyone who wants to develop skills for writing online for business or leisure. Where & when to apply: You can apply the strategies to any type of online writing, immediately after the workshop. Some skills can be applied to any type of writing. In the university environment, writing effective assignments is key to showing your learning to your lecturers. In most disciplines you will write different text types ranging from reports, essays, reflections, exercises to case studies. Each of these texts serves a different purpose and is structured in a specific way which your lecturers expect you to follow. In this workshop, you will learn the principles of writing for specific disciplines, including identifying the context and the purpose of the text, the shape it should take and its register. Our learning activities will help you to write effective assignments specifically for your discipline. Analyse the genres of your discipline and plan to write in the appropriate register for your specific context. Anyone who wants to understand how to write for their specific disciplinary context. Where & when to apply: Assignments in your core modules.